Boeing's 767-300 was developed from the earlier 767-200. Optimised for transcontinental distances, it became the aircraft of choice for North American domestic flights. The “ER” extended-range version can be used for longer range flights as, and is popular on North Atlantic routes. In Asia, it is well used for medium range international flights. The 767 was the first of the “4th generation” airliners, the first to be designed with the now ubiquitous “glass cockpit” and 2 person flight crew, and the first airliner to be certified under the then brand-new “ETOPS” regulations. The moulding is Hasegawa's traditional crisp and clean. There is minimal flash, and no sink marks. This is especially impressive for a kit which was first tooled in the mid 1980s. The panel lines on the wings and tailplanes are raised, but very fine. The fuselage has a mix of engraved and raised panel lines. This kit has been released many times, with decals for all of Japan's airlines and many foreign ones. 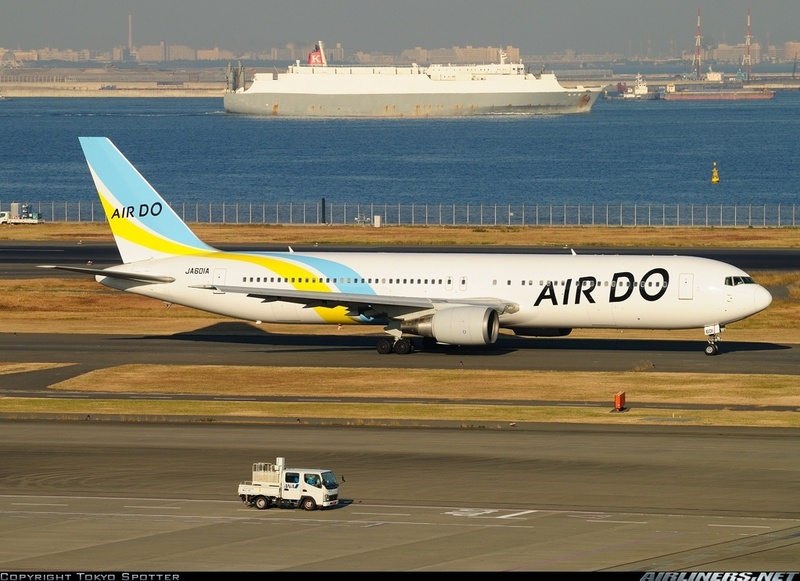 This boxing provides markings for Japan's Air Do, which is based in Hokkaido. Hasegawa includes an optional stand, but the kit is not engineered for raised gear. The fuselage is two halves from nose to tail. The cabin windows are open, with no clear parts provided for them. Either fill them or Krystal clear/Clearfix them; decal film just won't do it. No interior detail is provided, and the small windows would render any interior redundant anyway. The windows are not especially accurate; the corners are much too sharp. Correcting them would be very difficult indeed, so it's just as well that Hasegawa provides decal windows in this box. The cockpit windows are the old-fashioned Airfix style strip, which makes getting them to fit properly without either breaking or falling into the fuselage something of a challenge. The panel lines are very fine raised lines which match up well. The APU exhaust is blocked off a short distance inside to prevent the see-through effect. If the windows are left open, the interior should be painted black to prevent the model from looking toy-like. Hasegawa provides a novel nose weight in the form of a screw which must be inserted into a bulkhead which fits behind the cockpit area. The fit between screw and bulkhead is very sloppy so it should be locked in place with superglue or epoxy. The tailplanes are one piece mouldings that fit very well but still need glue. Leave them off until final assembly to facilitate decalling. The vertical fin is part of the fuselage mouldings. The rudder is completely on the left fuselage half. This makes for a very fine trailing edge, but that comes at the expense of a seam which must be filled on the right side at the rudder's leading edge. Careful fitting will help to minimise it but cannot completely eliminate it. The 767-300 is powered by GE CF-6 engines, which are neatly represented by two cowl/strut halves, an intake fan and exhaust/hot section. The kit's age is betrayed by the fact that there is no separate intake ring, as has now become commonplace in current airliner models. Some careful filling and sanding will be necessary to cover up the seam which will be left over after gluing the cowling halves together. The landing gear struts and wheels are somewhat overscale, something of a trademark of Hasegawa's 1/200 kits. While they'll look the part, they're definitely not as finessed as similar mouldings in 1/144 can be. The gear doors and wells are devoid of interior detail, but little can be seen in this scale. The main gear wells have no side walls. It would be possible even at this scale to box them in. I don't compare models to drawings or published measurements. When assembled it looks like a 767-300, especially after the windows are filled in. The decal sheet is very complete, with a good variety of stencils and complete markings for one of Air Do's 767s. A full set of window decals is provided for those modellers who like to use them. If the window decals are not used, the decal sheet provides separate door and emergency exit outlines. If you're not happy with the kit scheme, aftermarket sheets abound. Markings for just about any 767 which ever flew are readily available. The kit may easily be cut down to model the shorter 767-200. It makes a good subject for your first conversion due to its simplicity. JA601A on the taxiway at Tokyo Haneda Airport. Highs: It's nice to have this kit back in production. Lows: Overscale landing gear, raised panel lines on the wings, inaccurate windows. Verdict: This is still an impressive model nearly 30 years after it first appeared.